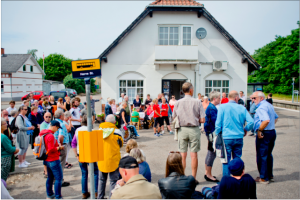 Our first meeting with citizens in Hørve shows that committed and organized community work is an important component in revitalizing urban functions and meeting places around residental subdivisions in minor towns. A recently established civic centre has formed one of the backbones to foster social network activities for the community. Experiments with repair cafes have shown to be a valuable platform to meet across generations and different cultural backgrounds. Also the town has recently started organizing events that activate empty retail buildings to showcase the potentials of the community life. We see plenty of capacity building potential to be further developed here.